Aunie Sauce: This is blogging's fault. Unless it's like... for puppies, makeup or tubs of ice cream. I like to get in and out without a fuss. No buying of accessories, purses, shoes, or whatnot. I get the necessities and I'm done. But nowwww that I'm a "personal style blogger,"
shopping seems to be important. I'll admit, I still really only do it when I have to. But when I have to? It seems to take a lot longer than it used to. so yesterday I popped into the store to pick up a new piece to wear. I ended up not only buying something that is "fashion-forward," but I also bought earrings. After that, I swung over to Nordy's Rack to pick up some basic tanks. You know, pink and tan, to complete the set of the other 4 colors that I already have. Sweet aviators (which I also bought). You guys... this is so not me. Leaving the store with 4 only items was hard. Usually, getting me to go in is the chore. And when I do? I hardly ever find anything I like. all of a sudden clothes are like... calling my name. Pleading to be purchased and styled. They should know my checkbook better. Blogger-- just so you know, today we are kind of not friends. By now, I'm pretty certain that you know I love the company JAVOedge. I did my first product review for them on their purple wallet case about three weeks ago. I compared pros and cons and told you how much I loved that little purple case... because I truly do. However... JAVOedge has a new product from their summer line that has totally stolen my heart. No, it's not an iPhone case per se... but it does have a place for my iPhone. See that little middle slot? Ideal iPhone location. When my phone's not in there, I use it to stash my business cards. Because I'm so official. This product is actually their zipper wallet case, and it's completely replaced any wallet in my collection. It's bright. It's funky. It has a place for credit cards, cash, extra cards (4 slots total that fit all of my random cards... which total 14. I had to count for you just to prove that the slots really do accommodate your card stash). Anyway... I love it. Similarly to how I did my other JAVOedge review, I thought I could provide you a little review of the pros and cons for this little zipper case. It's small enough that I can fit it in any of my purses (I prefer small purses over the suitcases you see some ladies carrying around). It has a detachable wrist strap so you can toss it in your purse, or take it on the go. I always carry this case with me when I go out. I just attach my keys to the strap and I'm good to go. It comes in a variety of colors! I'm so smitten with the yellow and leopard. The turquoise one was my second choice. The price! I tried to go to the store the other day to buy a glittery iPhone cover, and the bum wanted to charge me $44.95. Are you kidding me? This wallet case sells for $29.95 which is so awesome because it is significantly less that what I would pay for something like this. It matches my new iPhone case that's coming to me next week! (see previous number 4... iPhone case @ JAVO = $13.95. Case @ AT&T store? $44.95. Ridiculous). The material is an imitation patent leather, so it wipes off easily and protects my phone when it's inside. This case solves the issue I had with my last review, because I can just slip my chapstick inside the slots when I need to.You can also keep change in here because the zipper ensures it doesn't fall out. Like I said... It has good storage space. It fits 14 of my cards in the slots alone. Right now, I have a total of 23 cards in there and I can also fit in my iPhone and zip it closed with no problem. I would have loved to have seen the same 3 card slots that are on the inside front duplicated on the other side as well. Don't get me wrong... 4 slots total is great, but I love having an organizational pattern to my cards. Reward cards here, insurance cards there... you get my drift. I can sacrifice putting them all together for this little case. If the goal of this case is your primary wallet, and you're a big wallet kind of person, you may find this one a bit small. You can't put a checkbook in it, or have all your dozens of credit cards displayed. But for me? This is the perfect size. Cards? Check. Cell phone? Check. Wrist strap? Got it. That's all I need. To be honest? I had to be really picky to find any cons. I don't see myself using a different wallet anytime soon... unless I decide to grab another color, perhaps. I am absolutely certain that if I saw this wallet in a store, I would purchase it on the spot. But you know what's easier? Shopping online! And JAVOedge has made that so easy because they've given us a code to use for an 18% discount: auniejavo. The code is good for 18% off any of the Zipper Wallet Cases (10 colors) and any of the iPhone 4/4s Wallet Cases (solid colors and leopard print that I reviewed here). The code is good for one item per transaction and will be valid until July 24th. And see ... I told you, now we all want these cases. I love those iPhone carriers. I really want the blue turquoise one but even 24$ is too steep for me right now. I know how you feel though! I didn't care about anything until I worked at a clothing store. Then I cared. I'd rather lick the ground than go shoe shopping, but everyone on blogger frequently shows their heels and wedges and kicks and I'm like -- oooooh I want that! It's ridiculous. i'm glad you finally got the shopping bug. it's a good bug to have. except for the spending money part. if only the trees in my backyard would start growing money. You look so completely darling!! 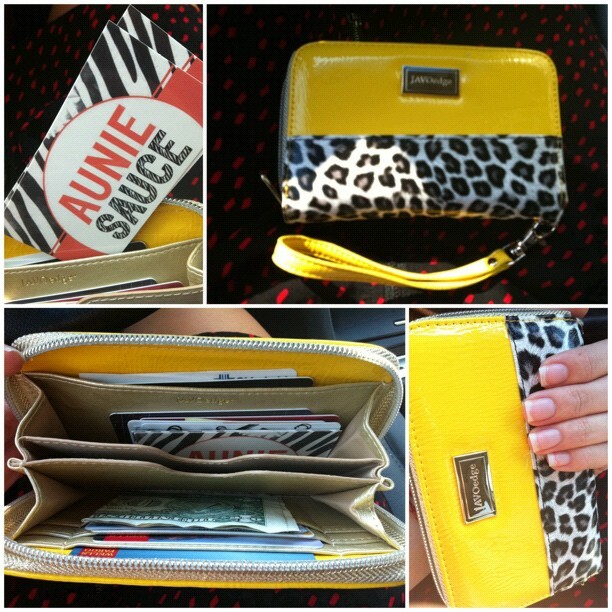 I want one of those iPhone wallets so bad, saw it on Erin's blog (Living in Yellow) a few days ago! Also, your nails are to die for! Man, I've been in love with everything they have since your first post about them and now you go and post a discount code. I'm doomed! but I usually just carry, card, keys, id, phone. fun nails! and that outfit is so so cute :) you are adorable. 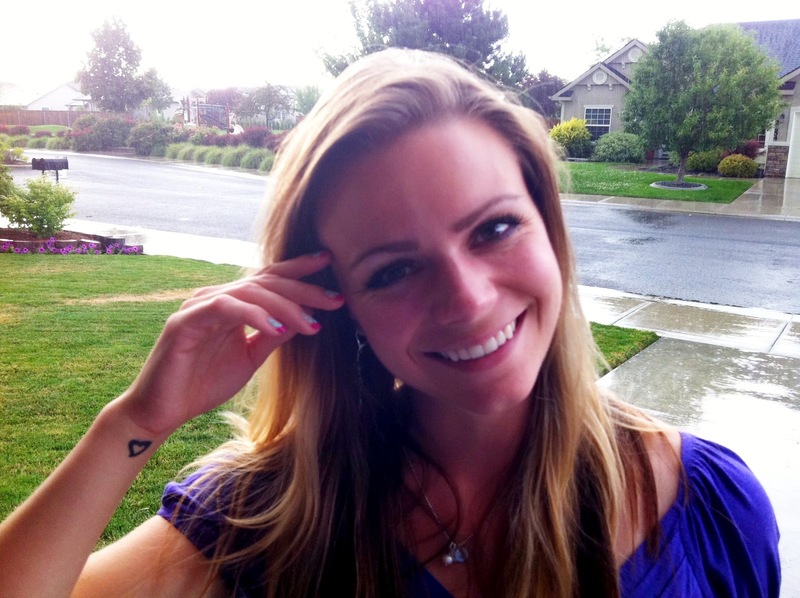 i agree with Christi Lynn, you are adorable. I used to enjoy shopping at one point and now i HATE it. I don't have time for it and I want to buy EVERYTHING! :) Those cases are super cute but I don't think my phone would fit with the case on it! you are so cute! love your outfit and your nails! that little clutch is so cute! Consider me your newest stalker, follower, however you want to call it. Also I try to be fashionable, after starting blogging I am much more aware. What is happening? ahhh! i feel like i am always in a constant state of shopping. i love this wallet case though! (: so super cute! and im loving your blog!! 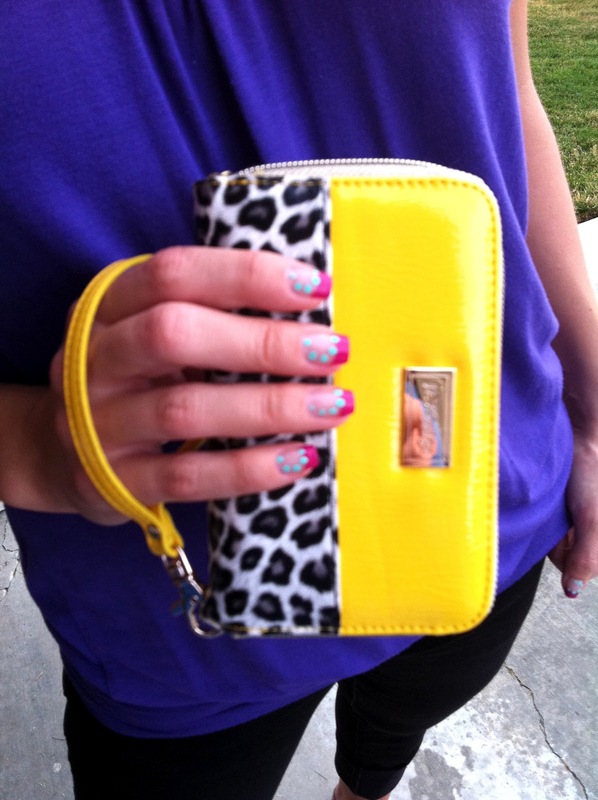 Totally loving your nails and that little purse!! Wish I had more of a budget right now so I could snap it up! And isn't funny how blogging does that to you! You look fab! nordstrom rack is so hit or miss for me but when it is good, it is dangerously good! A bloggy friend of mine did a post awhile ago called "Because of Blogging" and the shopping was one of the things she talked about. I find myself doing the same thing. Like Lisa Leonard jewelry for example. I would have NEVER known about it if it weren't for blogging. Also Erin Condren planners and JAVOedge. I totally know what you mean...We have to look cute for the blogs! I guess I didn't know you were a "Personal Style blogger", I just thought you had style! I guess that means you don't seem like you are trying too hard and are doing a dang good job! Keep it up! So I'm super late on this, but I just bought this zipper wallet in beige. I kept this wallet in mind because of your post. I decided on this wallet for a couple reasons: 1) I need a new wallet, mine is starting to fall apart (literally), 2) my back is KILLING me from lugging my giant purse around, 3) I want to be able to carry around my iPhone and my wallet together. Love your posts - and I definitely kept your suggestion in mind when it came to this product! I just found this post... and am in love. Once I switch to my 5, I'm totally getting one!! oh i'm so glad! this is STILL my go-to wallet. i love every aspect of it, though the yellow has dirtied just ever-so slightly. my favorite part is how affordable they are!